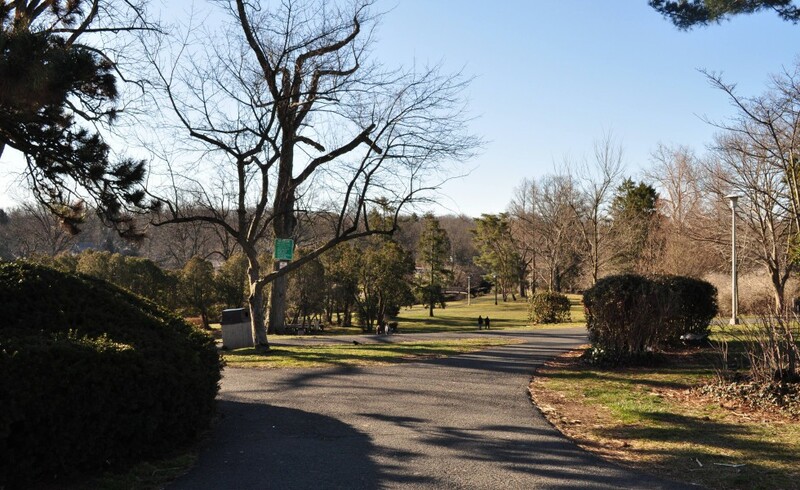 Maplewood Memorial Park consists of approximately 25 acres, bounded by Valley Street to the east, Baker Street to the south, Dunnell Road to the west and Oakland Road to the north. The park is a large, triangular-shaped, landscaped area, designed in the picturesque tradition with artfully arranged trees and shrubbery, winding foot paths, and gracefully arching footbridges. Oakview Avenue bisects the park from east to west. The park features rolling hills and meadows, clusters of trees within and around the perimeter, curving pathways that open up to long vistas, rustic stone and wooden bridges over streams, a rock garden, as well as ball fields and playgrounds. In 1922 the Township hired the prominent landscape design firm of Olmsted Brothers to create a picturesque park on the land they had assembled. Memorial Park was dedicated in 1931 to the men and women of the Township of Maplewood who served their country in World War I. A stone monument with a dedicatory plaque is located on a rise at the southern end of the park near Baker Street. In contrast to the classical formality of other municipal buildings, the Civic House/Shelter House, constructed in 1929, was designed in an Arts and Crafts style and was designed by local architect Charles C. Grant (architect of the old police building). It serves as the location of civic activities and meetings such as the Boy Scouts and Girl Scouts and continues to be a center for community activities and offices. These buildings were included in the original designs for the park and are integral to the many uses of this space. The Skate House, constructed 1929-30, is a small, one-story wood frame building, rectangular in plan with a moderately pitched hipped roof. The small Skate House was designed by William Mitchell and constructed in 1929-30. This building historically provided shelter from the cold to skaters at the nearby frozen pond.